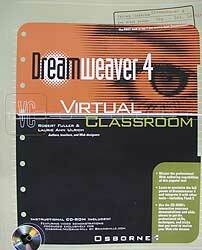 Dreamweaver 4 is the latest book in Osborne's Virtual Classroom series. This series combines the written word and screen shots of a tutorial book, with the streaming video of an instructor-led course on a multimedia-rich CD. The educational video lessons correlate to the text and exercises in the book to help visually reinforce important concepts. Dreamweaver 4 -- Virtual Classroom is 350 pages (over 15 chapters) and is available in paperback (ISBN: 0-07-213108-X, $39.99) with a CD-ROM.